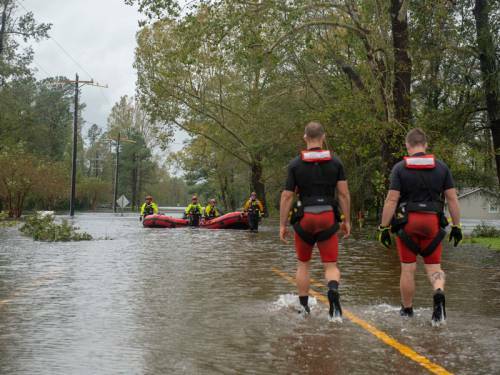 LOUISVILLE – Presbyterian Disaster Assistance (PDA) sent three National Response Teams (NRT) into North Carolina and South Carolina in the wake of severe flooding caused by Hurricane Florence. The teams deployed into the presbyteries of Coastal Carolina, New Harmony and New Hope to make initial damage assessments, meet with presbytery staff and pastors in the affected areas, and be a presence for those affected by the storm’s extreme rainfall amounts and wind damage. Flooding and loss of housing, particularly for those most vulnerable, are the biggest short-term concerns for residents of the impacted areas. Florence dumped an estimated 30 inches of rain onto some areas of the Carolinas, resulting in 45 deaths, more than 500 rescues, and damage to roads and infrastructure including low-lying water and sewage treatment facilities. Flooded hog lagoons and coal ash dumps contaminated soil and rivers used for drinking water. Gail Farnham, an NRT team member who led a team into the Presbytery of New Hope, which includes New Bern, North Carolina, near where Florence made landfall, noted that housing for people who have been displaced from their homes in and around New Bern is a very real problem. Dave Thalman, NRT team leader, led a group into the Presbytery of Coastal Carolina, an area just north of the South Carolina border that stretches from the coast westward and includes Wilmington, Lumberton and Fayetteville. His team encountered lots of road closures, flooding and fallen trees. He noted there was extensive damage to businesses, homes, schools and churches surrounded by pockets of severe flooding. Residents, some of whom were just recently getting back to normal from Category 3 Hurricane Matthew in 2016, were understandably unsure about the future. Bill Neely, a retired pastor and NRT member, deployed into the Presbytery of New Harmony in South Carolina. Neely’s team saw a more condensed damage pattern consisting of flooding with little wind damage, unlike the more widespread devastation found to the north. As is often the case, communities impacted by poverty and those least able to deal with disaster were affected the most. Neely noted that most of the affected properties were rentals and there is no more housing available in the immediate area. Hourly-wage earners and migrants are among those left without alternative options for housing and work. For Presbyterians or congregations looking to provide help for Florence-affected residents, there are both short-term and long-term solutions. Thalman noted it’s still early in the process to assess resident needs. That doesn’t mean work isn’t currently ongoing, and some Presbyterian pastors have committed to work together to aid their parishioners. “The four pastors in the New Bern area are working together to support one another and identify areas of need. There is also a long-term recovery group in place there,” said Farnham. You may also donate by phone by calling 1-800-872-3283 Monday through Friday, 8 a.m. to 6 p.m. (EDT).